Hong Kong physician, Dr. Stanley Lam provides the reader with not only his personal story of years of pain from athletic injuries relieved with self-administered Prolotherapy, but those of two other cases—one patient with spinal cord compression and another with undiagnosed Barre-Lieou Syndrome whose pain complaints were cured with Prolotherapy after many traditional treatments failed. Figure 1. Dr. Lam performing Prolotherapy for a patient with chronic low back pain. I started doing musculoskeletal medicine because I myself suffered from chronic lower back pain radiating down my right thigh on prolonged standing and walking when I was still a resident. The pain responded poorly to the oral medicine of various kinds. It was only partially and temporarily relieved by manual medicine. The pain became more infrequent after I had been found to have a 6mm shorted left leg and over-pronated feet during a lower limb biomechanical workshop. But it was still there because of the long history of ligaments laxity from distorted biomechanics and repeated micro-trauma from sports and practicing manual medicine myself. I finally got total pain relief while participating in a Prolotherapy workshop in Mexico with Dr. Joel A. Bereneim, D.O., when he performed Prolotherapy on my lower back. I also had a history of bilateral wrist pain on forced extension of my wrists, which I believe a lot of musculoskeletal physicians will commonly have because of ligament laxity from practicing manual medicine. I have performed Prolotherapy on my own wrists twice, each to one side by the other hand. (See Figure 2.) They are pain free now but I still have mild clicking during supination and pronation. 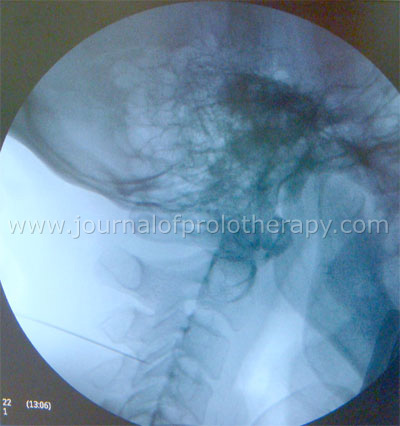 I am planning on doing Prolotherapy to them again in the coming few months. Figure 2. Dr Lam injecting his left wrist with his right hand. Figure 3. 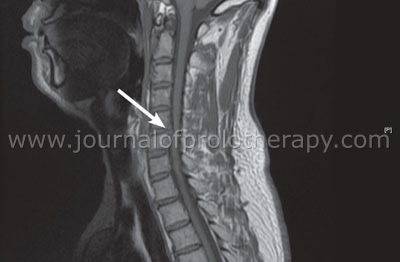 MRI of Mr. K showing compression to the spinal cord. Figure 4. MRI of Mr. K showing C5-6 protrusion. Nerve conduction velocity test showed normal peripheral nerve conduction. I performed the first Prolotherapy under fluoroscopic guidance in early February 2009 with 15% glucose (3cc of 50% dextrose mixed with 7cc of 1% lignocaine (lidocaine)). (See Figure 5.) The injection sites include: Both the superior and inferior nuchal lines, the interspinous ligaments from C2-3 down to T3, the facets joints from C2-3 down to T3-4, the origin of the levator scapulae at the superior and medial border of the scapulae, and the origin of the upper trapezius over the spine of scapulae, and the clavicles. After the first Prolotherapy, there was a 60-70% improvement in his pain and his gripping power increased to 5/5. He could resume his usual activities, including work, one week after the first Prolotherapy treatment. Figure 5. Prolotherapy to the C3-4 facet under fluoroscopic guidance. 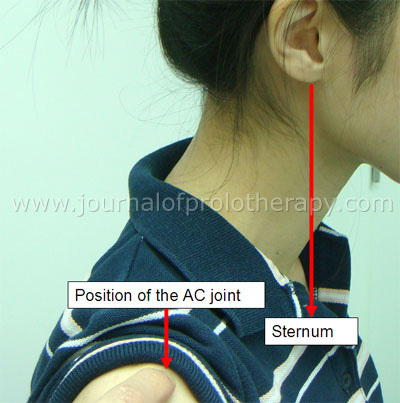 The second Prolotherapy treatment was initially arranged six weeks after the first in mid March 2009, but since he has nearly full recovery to his gripping power, there is no more pain in the neck and upper limbs, and he has resumed all of his usual activities, thus the second Prolotherapy treatment was cancelled. Ms. A is a 30 year-old financial planner, with a five year history of headaches, vertigo, tinnitus, ear pain, jaw pain, pain on wide-opening of mouth, and neck pain. She also describes a pins-and-needles sensation of the hands and forearms during sleep or prolonged use of a computer. She has difficulty concentrating on her work when she has the attacks. She had seen a lot of doctors for help. Her cervical MRIs were unremarkable. Previous treatments included physical therapy and chiropractic manipulation, each with only temporary, partial relief of the symptoms. She has very poor sleep and was labeled by some doctors to have psychosomatic disorder. So a low dose of antidepressants was given. She was also seeing ear, nose, and throat surgeons for severe allergic rhinitis and sinusitis with facial pain and had been put on intranasal steroid spray for one year with partial relief of the nasal symptoms. She also had gritty and itchy eyes with occasional tearing of eyes with a sense of fullness of the eyeball. She worried that she had glaucoma. She was referred to ophthalmologists for a thorough eye examination, which was normal. She was then labeled to have allergic conjunctivitis and was put on Sodium Cromoglycate eye drops again with partial and temporary relief of the symptoms. Figure 6. Photograph of Ms A. showing forward head posture. Figure 7. Dr. Lam injecting the structures that attach to the angle of the mandible. Figure 8. Dr. Lam injecting the left TMJ. 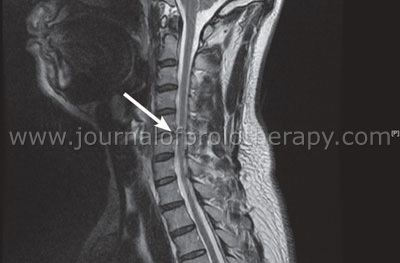 A 15% dextrose solution in lignocaine (lidocaine) was used to treat both the superior and inferior nuchal lines, the interspinous ligaments from C2 down to T1, the facet joints of the cervical spines, the origin of the levator scapulae at the medial and superior border of the scapulae, the mastoid processes and the angles mandibles, and the bilateral TMJs. She felt immediate relief of the headache, nausea sensation, and fullness of head after the injections. Her vertigo subsided one day after the procedure. She followed up four weeks later and stated that her headache, vertigo, tinnitus, nausea and vomiting, fullness in head, and numbness over her upper limbs had subsided. Surprisingly, her allergic rhinitis and conjunctivitis improved a lot. Her sleeping quality also improved and she no longer needed her antidepressant. She is now pain and medication-free after her second Prolotherapy treatment. She was taught the correct typing posture and self stretching techniques. I am hopeful she will remain pain free. Isaacs ER, et al. Bourdillon’s Spinal Manipulation. Sixth Edition. Woburn, MA. Butterworth-Heinemann Inc. 2002.